all the buses that are out now are the same? I understand we had the NABIs, we have Novas and the new Flyer and all 3 are different makes but they are the same to me. All of them are low floor, DEF/regenerated buses with the same personality. Before, all buses had their own distinctive personality and look. GM and Flxibles were similar but very different..slanted windows, fishbowl front, slanted back....but the engines sound different, print scheme diffeent....etc. flyers had their own look. The MAN Americana to me was a box bus, the RTS TMC was a bus I thought was famous because you saw them in New York tv shows and they were very uncomfortable in the rear with no space because of the rear wheel well. Once upon a time there was some variety in the bus fleet with Flx new looks, GMC new looks. Then came aloong the MAN artics, the Flyers, and MAN Americas. Then we had TMC RTS buses, and Flx Metros. Finally we got NABI artics, Novas, and New Flyers low floors (not in that order). Part of the reason that the fleet appears t be somewhat mundane is the lack of bus manufacturers. GMC, NABI (bought by New Flyer), Flxble, and Orion went out of business, and the Buy America act eliminates European and Asian manufacturers. That really only leaves New Flyer, Nova, Eldorado,Gillig, and Bluebird as eligible builders. For whatever reason, CTA specs tend to consistently eliminate the latter three from either bidding or getting accepted. 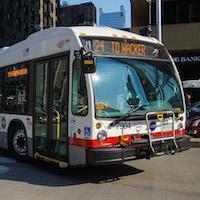 Note that Pace busses are NABI, Orion, and Eldorado, along with MCI coaches, none of which are used by CTA. Even in the coach market, there is only MCI, Prevost, VanHool, and Setra. MCI is the company that sells Setra in the U.S., ABC Bus Companies sell VanHools in the U.S. MCI and Prevost both have manufacturing plants in the U.S., though Prevost is actually headquarted in Canada. The choices with Buy America are limited. The flipside is that with a standardized fleet, there should be a cost savings in not having to stock different parts for different manufactureres. And to the chagrin of CTA5750, FG doesn't have to stock New Flyer parts at all, neither does Kedzie, NP, and 103rd have to stock any Nova parts..
You could use more descriptive topic titles if you are creating topics. Yes it is you. Essentially, no it isn't. You should ask the administrator to change this one to "Bus Design." As art points out, there is a limited number of assemblers. NF did away with everything other than Xcelsior (for a full size bus). Nova is essentially using the same design going back to 1996 or so, except that it now has the conventional engine placement, instead of the side engine in the 6400s (originally designed for low floor throughout). European style trends and functionality eventually make it here, including the more streamlined front ends, and both Nova (from Volvo) and NF Xcelsiors having the high engine cooling rear vents, for instance. Nova seems a bit ahead of the curve with the wrap around LED interior lighting and seamless floors. Also, it appears that the major bus assemblers have gone to composite skins. The topic has been [poetically] renamed. On the subject of bus design, MCI has just developed the D45 CRT LE, which, in a twist on the original RTS, has a low entrance at the center with a wheelchair ramp, and a lower vestibule with 5 seats and 2 wheelchair restraints. I'm not sure how a TA is to collect fares at the center door, unless this is supposed to be used in prepaid fare areas, but seems the ideal vehicle for CTA route 22 service to Northbrook Court (just kidding, or am I?). Also, back windows are coming back. Back windows coming back is at least partially because of security concerns. Cops want to be able to see as much as possible in case of s hostage or suspicious package situation. Kind of hard to see in a motorcoach sitting 12 ft high. Actually, the success of VanHools CX and TX coaches, which feature rear windows has prodded MCI to introduce a rear window in its J models. Years ago, Eagle buses featured rear windows, prominent on Trailways buses. Rear windows Gove the coach cabin a more open feel which is the impetus, and not security, for the uptick in rear windows on motorcoaches. That's what I figured. The website says "An optional rear window adds extra visibility and natural light to the cabin." Nothing about the cops looking in, although if the helicopter cops wanted to, I remember some Hammond charter buses with glass panels in the roof. Setra coaches have an option for glass ceilings on their Top Class S417 models. I believe they have an option for a 2nd door near the rear for faster hoarding and alighting. VanHools have that option on its doubledecker coaches. The Accessible area is cut off from the rest of the coach, possibly alienating those passengers. By adding rear steps, they may or may not feel as isolated, but the rear of the coach could access the 2nd door easily, especially if only none or only one wheelchair space is being used. Perhaps the current design maximizes capacity. And as you noted, MCI no longer sells Setra coaches as of the 29th of this month. I was also wondering about putting the accessible seating area on the lower level, but the site says that the advocacy community is o.k. with the design. The hike up both the front and rear stairs seems kind of steep, and I wonder why the floor has to be so high (there not appearing to be baggage compartment doors, unless that's the space for the promised CNG tanks or all electric bus batteries). It probably is better than getting on the lift coming out of the luggage compartment of existing deigns and being hoisted up the side of the bus. Another good reason for back windows - in case of wreck where bus ends up on its side, makes evacuation easier especially if front is crushed than removal thru side windows. I'd have to check, but I don't recall any rear windows ( even on CTA's Nova models) being designed as emergency windows that can be pushed out. This is especially true of motorcoaches in that half of the area is the lavatory which has no rear window access. Perhaps it can be or should be taken into consideration in addition to the passenger windows and roof hatches. Windows can be broken by emergency responders a lot easier than walls. Hard to say that. Both are composites or plastics these days. The question essentially is whether the back windows have release latches, as some side windows do, and are hinged. I haven't done an extensive search, but the only ones I remember having them were some MAN artics. I finally found the Pace April Board meeting video. At 6:00. T.J. Ross noted that MCI demonstrated the bus at the meeting. Wow that mci bus is kind of cool. They need to find some way to remove the stair lift and it looks like they found it. Very innovative. While motor coaches have lifts, they aren't in the stairs, but to a door where one of the windows would otherwise be. I'm not familiar with coach buses but you would think a low floor would remove the area used for baggage but utilizing a small area seems to be more doable. Bus reminds me of a Metra galley car. Would be interesting if pace bought a few of these. If Pace did have a meeting with these that may be a likely possibility. Since this is a commuter bus, baggage doesn't seem a big concern. As I noted above, I couldn't see why this bus's floor was that high. Would be interesting if pace bought a few of these. If Pace did have a meeting with these that may be a likely possibility. I thought that displaying a CNG bus was a joke, but aside from it having been a NABI, it wasn't. It wasn't too long of a trip from MCI's headquarters on Oakton in DesPlaines to Pace's, but I don't know how interested Pace is in converting the remaining 20 options in the current contract to this model. BTW, I don't know what was in the Pace driveway, but the bus in the video is certainly Pace blue. The thing about the lower space since it is still a motorcoach, is that a charter company, or Pace Special Events routes could use the remaining storage space for passengers to bring things like coolers, lawn chairs, foldable wheelchairs or things that would otherwise take up valuable space in the cabin. You won't necessarily need a cat or rv to tailgate. Would this be applicable to a regular highway motorcoach like a greyhound or trailways bus? I dont see how they are really accessible now without a traditional stair lift ramp. This could change the motorcoach industry, its that huge like nf started the low floor buses that changed the transit bus industry. How do Metra ramps work. I wonder if this same scenario wouldn't be applicable in a heavy rail transit vehicle. Stair lifts are old and unreliable. Would this be applicable to a regular highway motorcoach like a greyhound or trailways bus? This is advertised as a D class bus, which is a commuter coach. The highway coaches are J series. However, other than the transit type destination signs, I don't know what distinguishes them. See above. I'm not going to repeat myself. How do Metra ramps work. On diesel lines, stair lifts. I wonder if this same scenario wouldn't be applicable in a heavy rail transit vehicle. Stair lifts are old and unreliable. On Bombardier tin cans, such as on GO Transit and in California, the center part of the car is lower, so the idea is similar. Same thing with the Flexity LRV. Note that the windows between the doors are below the white stripe (embedded).